Rishi Mathur joined Founders Space as a mentor. He is a comedian from NYC. He performs all over the country and internationally. 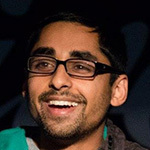 Rishi has worked with start-ups since 2011 and has helped them grow. He also helps teach improv/stand-up to founders so they feel more comfortable with public speaking such as pitching their company to investors or help their sales team learn key skills that help aid with their sales process. Improv is a key trait to learn. It allows you think on your feet faster and helps you learn to deal with anything that may come your way. Stand-up helps with stage performance. It teaches you to be concise and drive right to the point with your stories/ideas, both come in handy for any type of interaction or public speaking event.